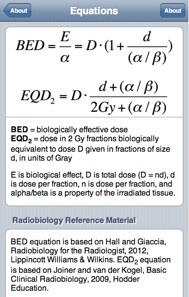 RBApp is a radiobiology calculator that automatically calculates BED (biologically effective dose) and EQD2 (equivalent dose in 2 Gy fractions). RBApp stands for RadioBiology Application and is a web application for Apple iOS (including iPhone®, iPad®, and iPod touch®) and a standalone program for Android™ and BlackBerry® mobile devices. It is also available as a generic desktop Web Application. RBApp may be useful for learners in radiation oncology, including medical students, residents, physicists, therapists, and oncologists. How do I get RBApp? If you are unsure which version to use, check our Editions table. 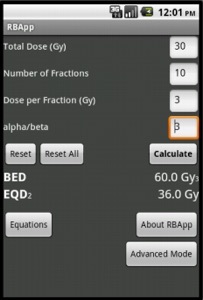 RBApp is a program that allows quick access to radiobiological calculations, right on your device! Keep in mind, however, that the results of calculations are for educational purposes only, and should not be used for clinical decision making. The Trademark BlackBerry® PlayBook™ is owned by Research In Motion Limited and is registered in the United States and may be pending or registered in other countries. RBApp is not endorsed, sponsored, affiliated with or otherwise authorized by Research In Motion Limited. Apple, the Apple logo, iPad, iPhone, iPod touch are trademarks of Apple Inc., registered in the U.S. and other countries. BlackBerry®, BlackBerry® PlayBook™ and related trademarks, names and logos are the property of Research In Motion Limited and are registered and/or used in the U.S. and countries around the world. Used under licence from Research In Motion Limited.